During a recent discussion with a client who is a senior category management director, she revealed a recurrent struggle to create a Category Review that was “best-in-class” for their organization. The conversation prompted me to go on a bit of a journey that started with a survey of our students and clients to get some perspective on the biggest areas of opportunity and led to revealing some serious pain points for organizations. 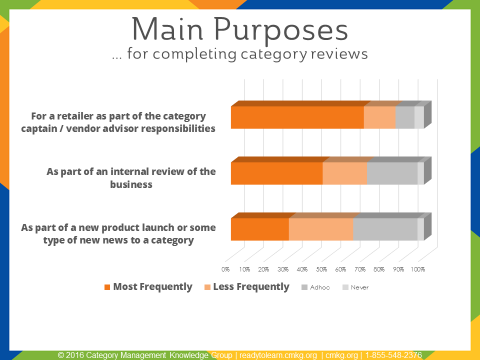 The most frequent Category Reviews are ones that are created for a Retailer as part of the category captain / vendor advisor responsibilities, with over 80% of respondents doing this most frequently (dark orange) or somewhat frequently (light orange). The second purpose for Category Reviews is for internal reviews – for a category or brand health assessment, market assessment or some type of internal ask. Category Reviews are also frequently developed as part of a new product launch or with news related to the category. Decrease creation time and increase insights time. Almost 100% of respondents agreed that TIME SPENT creating Category Reviews is the most important opportunity. This could be done by implementing #2 below. 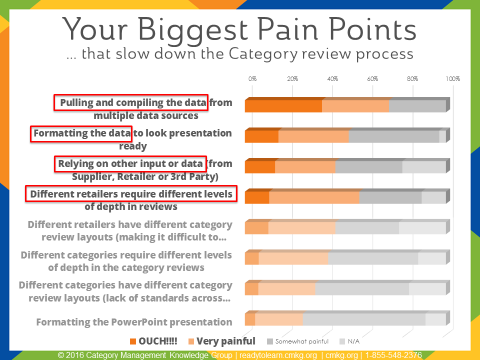 Create standards and best practices for developing Category Reviews. Over 90% of respondents found this most important or very important. I have subsequently spoken to several directors of category management who unanimously agreed that this is an incredible opportunity. For many organizations, their CatMan team is creating Category Reviews almost from scratch, or by using someone else’s “old” Category Review and repulling all of the pieces to create the new review. 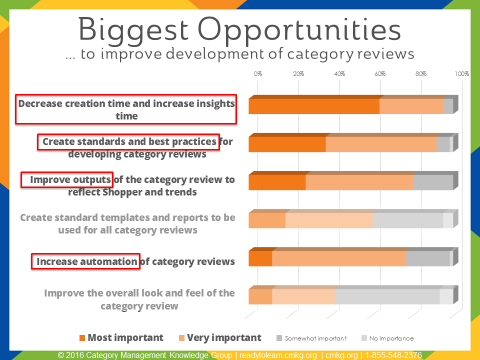 Improve outputs of the Category Review to reflect Shopper and trends. About 80% of respondents found this to be very important. Improved outputs relate to concerns clients have about improving the Category Review to capture changes in new data sources and the changing Shopper. Organizations are investing millions of dollars in Shopper insights and research but are not using it to anticipate what is going to happen in the future seen in the biggest trends evident in the data. Let’s integrate the Shopper more effectively into Category Reviews! Increase automation when you complete a Category Review. This is the 4th opportunity that was highlighted in the survey as being very important. Do you automate the data pulls or the PowerPoint presentation or both? Pulling and compiling the data from multiple data sources – how do we get better at this? What are some of the best solutions out there to do this? Formatting the data to look presentation ready – perhaps this can be tied in with #1 with the integrated data pulls formatted nicely and easy to copy into a presentation. Relying on other data or input (from Supplier, Retailer or 3rd party data company) – this is a more difficult one to influence because different Retailers have different levels of depth and different expectations in their Category Review. After our clients and students completed the survey, we ran a student webinar on “Best-in-Class Category Reviews” and learned that Category Reviews are a hot topic based on the more than 200 students who attended. The webinar was a part of our recurrent educational, bi-monthly webinars for our students and on-demand learning subscribers on topics of their choice. Companies need to create different standards and best practices behind each type of Category Review (based on the purpose). For example, a new product launch Category Review will look very different than one created for a Retailer’s category management process, which will also look very different from an internal category health or brand health assessment. Each of these should have customized approaches and processes, although some of the data reports feeding into them may be the same. The level of influence varies for Suppliers / Manufacturers to have standards, best practices and automation for Retailer Category Reviews as part of the category management process. This is because each Retailer has a unique catman approach, templates and requirements. However, participants did believe that there was “Medium influence” and opportunity for their organization to create some standard data pulls (including automation) across key data sources, plus maintain industry trends and Shopper trends updated in a central location, to reduce the time required to compile the information. Developing standards and best practices for Category Reviews behind innovation and category / brand health represents a big opportunity for organizations. This should uncover the biggest opportunities that each team can use as a starting point (rather than them each defining them on their own). This reduces time spent by team, allows strategic alignment and approach across teams, and improves the time spent drawing insights and strategic recommendations behind the review. Review more detailed results of the student survey. Learn how you can improve different types of category reviews through internal standards and automation. See examples of ways to apply best practices and gold standards in your organization.